To MCRD Gate 5: Drive south on Interstate 5. Take the Washington Street exit. At traffic light turn right onto Washington Street. Enter through Gate 5 – Washington Street. To MCRD Gate 4: Take Interstate 5 South to the Old Town Avenue exit. At the stop sign, continue straight to yield sign, turn right onto Witherby Street. Follow signs to Gate 4. To MCRD Gate 2: Drive south on Interstate 5. Take the Rosecrans exit. Continue on Rosecrans to Midway Drive (third light). Turn left onto Midway Drive and continue to the second traffic light (Barnett Street). Turn right onto Barnett – go to the first traffic light and turn left into Gate 2. To MCRD Gate 5: Drive north on Interstate 5. Take the Washington Street exit. Turn left on Washington Street and continue straight ahead to MCRD Gate 5. To MCRD Gate 4: Take I-5 North to Pacific Highway (exit 18A); stay in the right lane for 1.5 miles, exit right at MCRD sign (caution: tight circular turn), go under Pacific Highway. Follow signs to Gate 4. To MCRD Gate 2: Take Pacific Highway exit; stay in the left lane. Take Barnett Street turnoff and travel west past the Midway Drive intersection. At the next traffic light, turn left to enter Gate 2. To MCRD Gate 5: Drive I-8 West to I-5 South. Take the Washington Street exit. At traffic light turn right to MCRD Gate 5. To MCRD Gate 4: Drive Interstate 8 to Interstate 5 South. Take the Old Town Avenue exit. At the stop sign, continue straight to yield sign, turn right onto Witherby Street. Follow signs to Gate 4. To MCRD Gate 2: Drive Interstate 8 West to Rosecrans exit. Turn left at Midway Drive and continue to the second traffic light (Barnett Street). Turn right onto Barnett – go to the first traffic light and turn left into Gate 2. To MCRD Gate 5: From Rosecrans Street in Point Loma, turn right onto Lytton Street; Lytton Street becomes Barnett Avenue. Drive past MCRD Gate 2 and Gate 4. Continue south, stay in right lane and turn right on Washington Street which will take you to MCRD Gate 5. To MCRD Gate 4: From Rosecrans Street in Point Loma, travel east on Lytton Street; Lytton Street becomes Barnett Avenue. Drive past Gate 2 and continue east on Barnett. Stay in right lane and watch for immediate right turn exit (caution: quick exit) which will take you to Gate 4. To MCRD Gate 2: From Rosecrans Street in Point Loma, travel east on Lytton Street. At second traffic light, turn right into Gate 2. 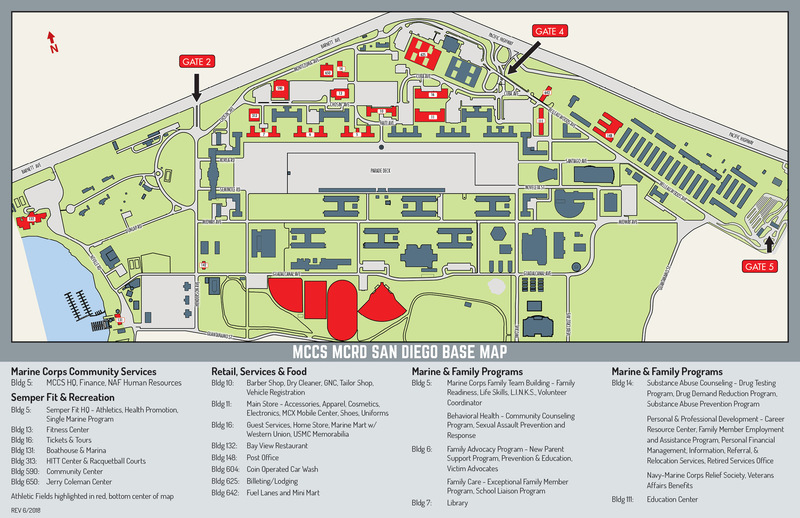 MCRD is located just northwest of downtown San Diego and north of the San Diego International Airport, Lindbergh Field. Gate 5 (Washington St.) is the main visitor gate. All visitor vehicles MUST enter through Gate #5 (Washington Street, exit off of highway 5 north or south) when opened. Vehicles and personnel are subject to search upon entry. Expect delay and plan accordingly. Speed limit throughout the base is 15-20 MPH. Please drive at 5 MPH when near marching troops and obey all traffic and speed signs. Identification: Every person age sixteen and older is required to have a valid form of photo identification to gain access to the Depot. This ID must be kept on their person at all times. Acceptable forms of identification include: state issued identification cards, driver’s licenses, passports, military dependent identification cards, and school/work identification cards. Driver’s License/Registration/Insurance: If you are driving a vehicle, ensure you have a driver’s license, vehicle registration card, and proof of insurance in your possession. Each of these items are required to be current and in a valid status. If you are unsure, contact your state’s Department of Motor Vehicles/Motor Vehicle Administration and they will assist you in determining the status of your driver’s license and registration. Firearms/Weapons: All firearms and weapons are prohibited aboard MCRD San Diego. Drugs: All controlled substances are prohibited aboard MCRD San Diego. Any person(s) found possessing a controlled substance or associated paraphernalia (i.e. smoking devices) will be found in violation of Federal law. A medical marijuana card does not authorize possession of marijuana aboard MCRD San Diego. Contraband will be seized and offenders may be cited and denied entry.